Carmel visitors often want to go to "Clint Eastwood's restaurant" in Carmel. It's a fun idea, and Eastwood's Mission Ranch is a favorite place for a sunny Sunday brunch. It's a no-fail destination to take friends and out-of-town visitors, too. And all of that would be true even if it weren't owned by a famous actor. 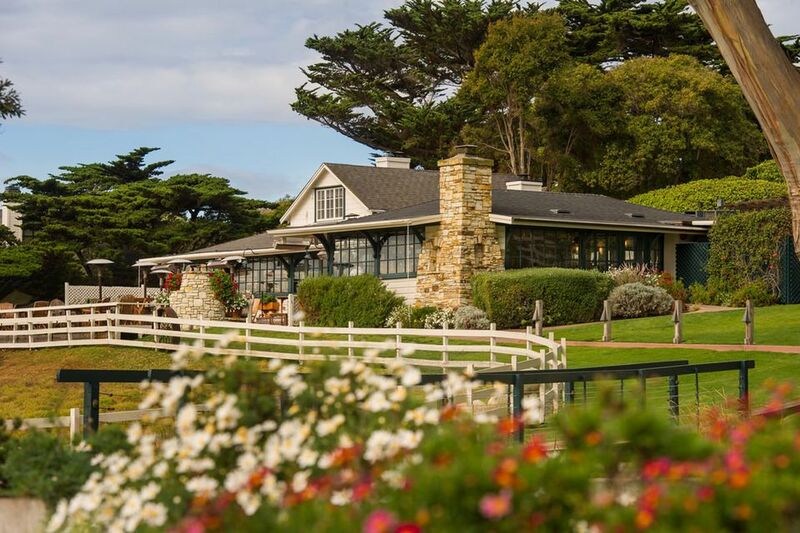 Mission Ranch is a hotel with a restaurant, occupying a former dairy farm that was saved from becoming a housing development when Clint Eastwood purchased it. It's an act that's as applause-worthy as any of the actor/director's greatest films and performances, preserving a pastoral view of the Carmel Bay and Point Lobos. The Mission Ranch dining room is a comfortable place, without pretense or snootiness. You'll find a piano bar nightly and a live jazz ensemble on Sundays. The food is traditional, but well-prepared, especially the prime rib, but its strongest suit is its outdoor seating. Behind the restaurant, a brick-paved patio that faces a picture-perfect pasture full of grazing sheep. Watching them while eating Sunday brunch on a sunny day is incomparable. And the sheep are so cute they have been known to gather a round of applause as they hurry to get into their pen at sundown. Beyond the meadow, you can see waves crashing on the rocks at Point Lobos. The atmosphere creates a perfect storm of relaxation. In fact, you could have trouble getting your friends (or yourself) to go home from Mission Ranch after brunch or a late afternoon cocktail. To be sure you have the right expectations, you're not likely to find Eastwood at his restaurant, but you can still collect bragging rights for eating at his restaurant. You can even take a selfie or two and post them on social media. Then turn off that mobile device and enjoy the place in real time. The restaurant does not take reservations. With so many things going for it, you might expect a long wait, but that isn't always the case. Nevertheless, don't be surprised if it happens. With such beautiful surroundings, you can take a walk or stand and gaze out to sea until your table is ready. During the Pebble Beach Concours d' Elegance in late August, the restaurant is open but they serve a limited menu. Visitors give the Mission Ranch restaurant good ratings. Among the things they comment on are the desserts/sweets table at Sunday brunch and the beautiful view from the patio. They also say it's a must return tranquil location. But this sums it all up. "I can't say the taste of the food is extraordinary. Still give it 5 stars." If you can't bear to tear yourself away from Mission Ranch, you can also stay overnight. The hotel is an excellent base for exploring Point Lobos, taking the 17-Mile Drive, seeing the Big Sur coast and the towns of Monterey, Pacific Grove, and Carmel. Some of their rooms are part of the old dairy farm, and others were built when the hotel opened. You can read reviews of Mission Ranch and compare prices at Tripadvisor. You can also get more information about the hotel at the Mission Ranch website. Don't let out-of-date information lead you astray. Here's the straight story: Clint Eastwood and his partners once owned the Hog's Breath Inn at San Carlos and Fifth Avenue in downtown Carmel, but they sold it many years ago. Why is Clint Eastwood so Partial to Carmel? Eastwood probably likes Carmel for the same reasons the rest of us do: crashing waves, sea otters playing in the surf, incomparable ocean views are hidden around every corner and a relaxed ambiance to calm the most frenetic of souls. Eastwood is a native Californian who discovered the Carmel area during the Korean War when he was stationed a few miles north at Fort Ord. After leaving the military, his friends Martin Milner of Route 66 and David Janssen of The Fugitive persuaded him to try acting. The rest is movie-making history. Eastwood spent his early movie-making years in Los Angeles, but he eventually returned to the Carmel area, where he still lives. Eastwood demonstrates his love for the Carmel area in his professional life. He named his production company, Malpaso Productions for a creek just south of town. He even directed his first movie here in 1971: Play Misty for Me, the story of a late-night jazz DJ who is terrorized by an obsessive ex-lover. The film was set in Carmel and Monterey and features many local sights, including nearby Point Lobos and downtown Carmel. As if all this weren't enough, in 1986 Eastwood wanted to build a small building in downtown Carmel. The town’s bureaucratic government hindered his efforts, and he decided to do something about it. He ran for mayor, winning with 72% of the vote. During his two-year tenure, he successfully made it easier to build or remodel, got a tourist parking lot built, rescued the historic Mission Ranch from developers and opened a children's annex to the city library.